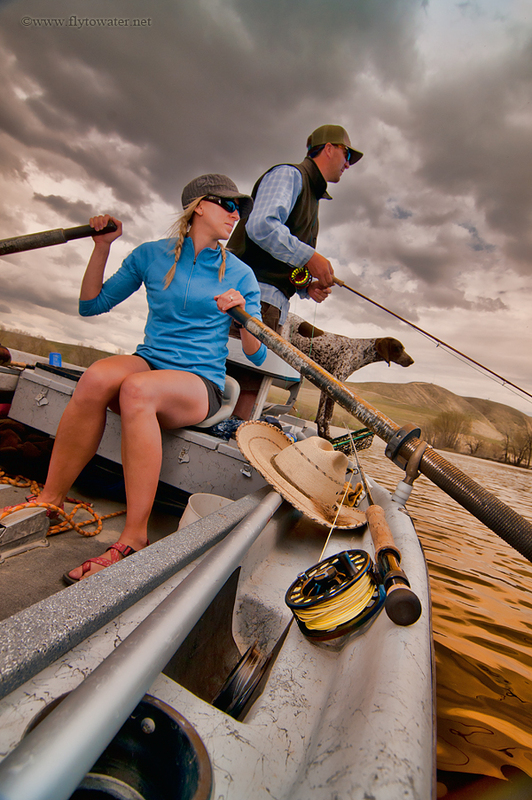 You arrive on location for a day on the water, planning to pursue the prized species of your choice. Awaiting you is a well-maintained, late model drift boat ready to embark. The on-board cooler has been filled with your food and beverage of choice. Nothing too unusual for a guided outing so far, and no suspicions are aroused. During a non-fantasy outing, the guide then emerges from his vehicle. He is a bedraggled individual, bleary-eyed from lack of sleep the night before. He stares at you with a morose, far-away look through sleep-sodden eyes and breaks the predawn silence with a belch that wakes up every bullfrog within a 10 hectare radius. This is likely to be one of his more pleasant biological emissions as the day progresses. Allowing our minds to stray, let us instead imagine a slender blonde lithely exiting the guide vehicle, attired in some aesthetically pleasing shorts. Braids keep her golden locks at bay, because she is all business. Barking a few initial orders lets it be known who runs the show. While certain stereotypes attempt to crowd their way to the front of the mind about this being a man's game, quality work at the oars quickly puts all concerns soundly to rest. The fictitious blonde proceeds to put you into the most fishy water around, pausing only to grab you an ice cold beverage the instant you begin to feel in the least bit parched. Approaching a stretch where some technical casting is required, you festoon the branches on shore with a series of macho yet ineffectual casts. It turns out the archer fish is among the few species that will strike at a streamer a full 6 feet above the surface of the water. 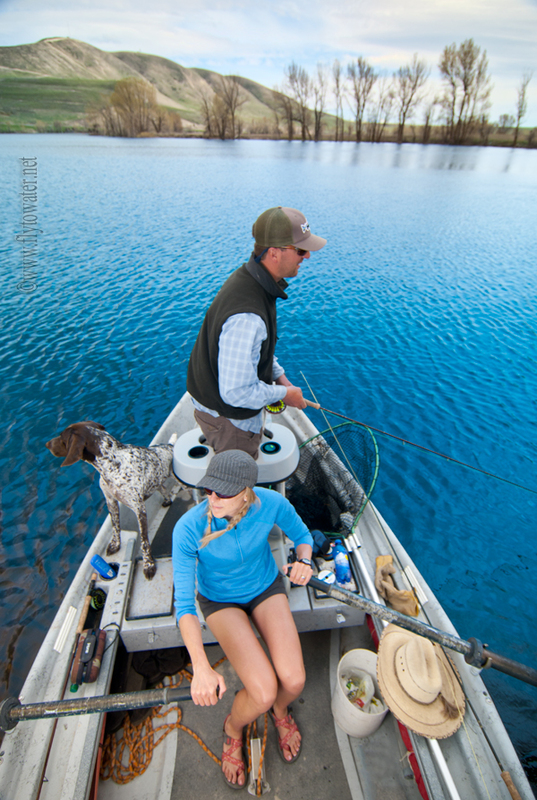 Your petite guide assists with fly retrieval, and then adroitly performs numerous and flawless casts in order to demonstrate proper technique. She hands the rod back to you with a snide remark, something like "Now keep this bug out of the damn cabbage!" Sound preposterous? I would wholeheartedly agree if it wasn't for the fact that the scene described above materialized right before my eyes this weekend. Some lanky, fleece-vested type loosely associated with WorldCast Anglers claimed to have something to do with Missy's formidable skills on the sticks - but history teachers are notorious for sweeping exaggerations. If you don't believe me consider this: Following the War of 1812 (actually taking place in 1812, 1813, 1814, and 1815) came a period known as The Era of Good Feelings. It turns out that during this time, there were numerous BAD FEELINGS which were swept under the carpet, ultimately exploding into The Panic of 1819. High school history teachers have collectively refused to address this glaring issue by renaming the span from 1816-1824 "The Era of Mixed Feelings." Many thanks to Missy & Casey for letting me tag along on the trip. I broke out the trusty Singh-Ray Gold & Blue filter to create the look in these images in-camera. wow!! Can those pictures be anymore perfect? Great images, Brett. 1st image is very, very solid work. Keep it up, brother. Fine shots. The color of the water in the first shot is amazing. Thanks Mike - how's the new job treating you? Have you had the chance to huck line up North? SRM - much appreciated. Nice work on the Blue Collar Issue. Dennis - thank you for the comments here and on Flickr. Under the right conditions a good filter can really set off the reflections in a scene. Really enjoyed the post...great photos as well! Glad you enjoyed it Sanders. Mrs. FlytoWater still can't believe that Drift Boat Barbie rowed us around all day, but I am merely reporting the facts. Too funny, great shots man! Thanks Troutdawg - enjoyed the shots of those slabs on FFA. Hey, I just signed up to follow and hopefully learn about some photography. That filter really makes those colors come alive. Glad to have you JGR. I've been enjoying your dispatches from the field and am following you as well. Great stuff! Love your site. Add us to your blogroll? We embrace infantile comments, haha. JB: Thanks for dropping in. I'll add you if you'll add me.